September 28, 2017 13 Comments This post may contain affiliate links. 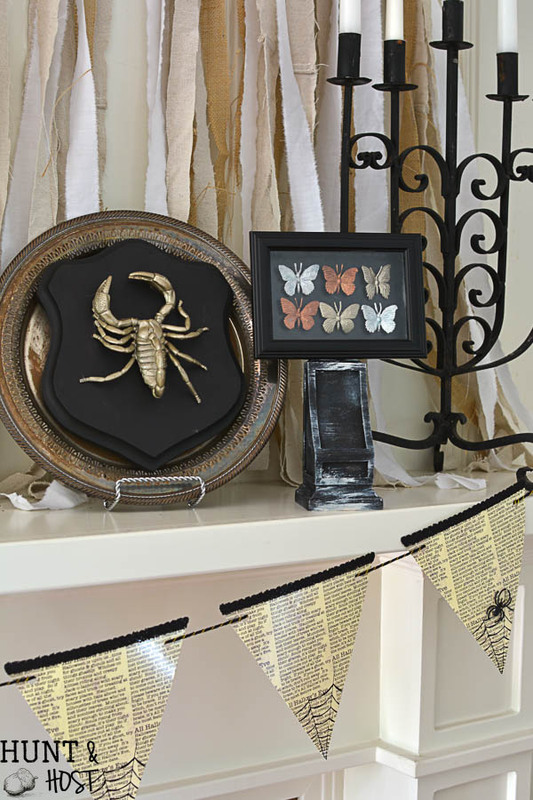 Dollar Store Halloween Decorations are fun and affordable like these gilded bugs on display! I am having so much fun with dollar store Halloween decorations this year! Last year, for whatever reason I just couldn’t pull it together (we only got the table decorated). Sometimes that happens. 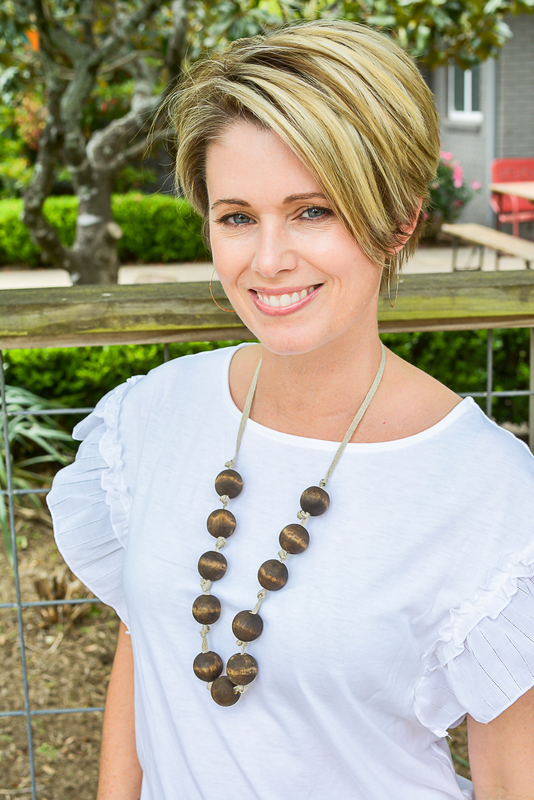 Grace is a good thing! 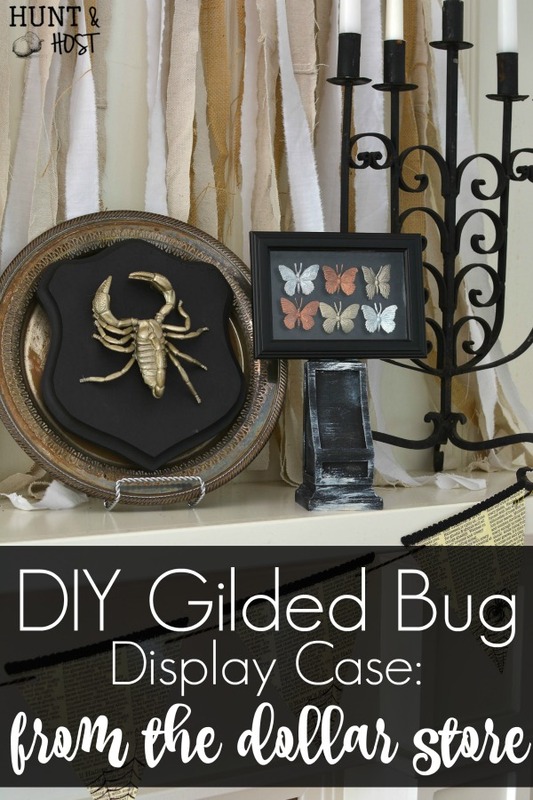 I can’t wait to show you how easy it is to make these gilded bugs display cases! 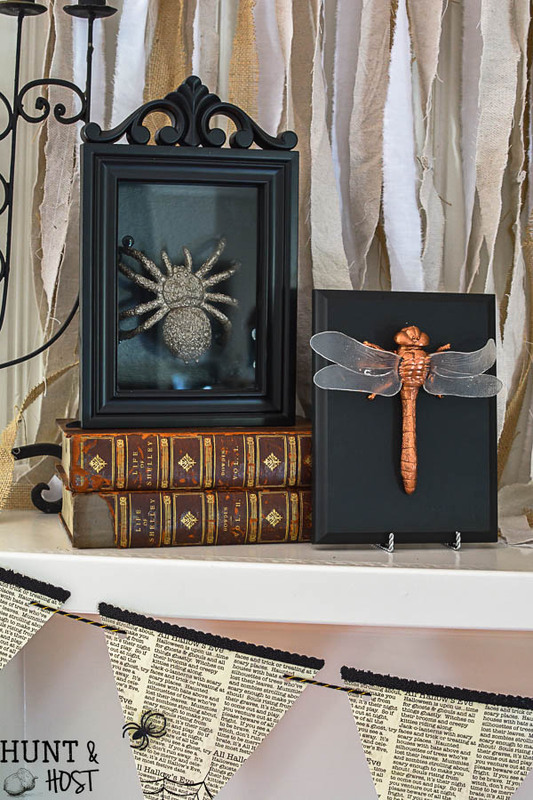 I am not going to name names, but I after I finished decorating with my new creations I plopped down to go through the magazines and catalogs collecting dust waiting on me and saw super similar gilded bug displays for sale…for $40-$50 a pop! Mine cost a whopping $5 max each if you count the cost of new spray paint and glue, which I already had on hand! So mine where $2-$3 each! 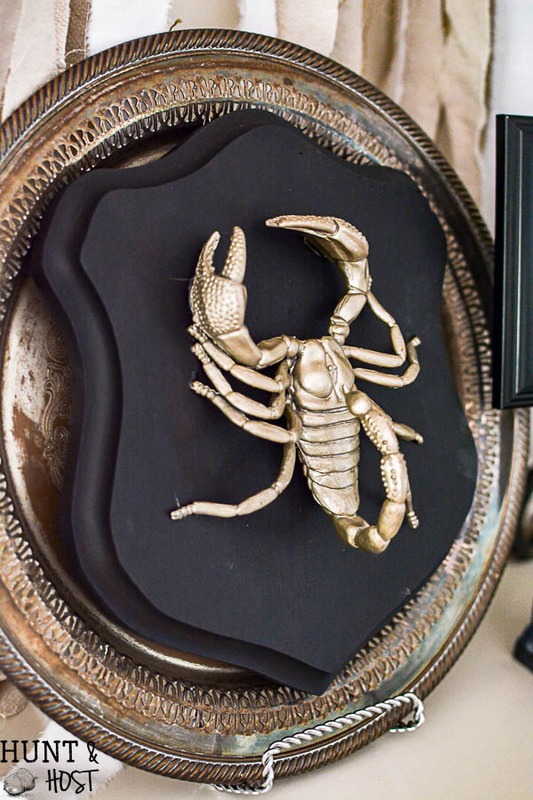 I decided to go a little glam this Halloween and I can’t wait to share my Halloween table next week! 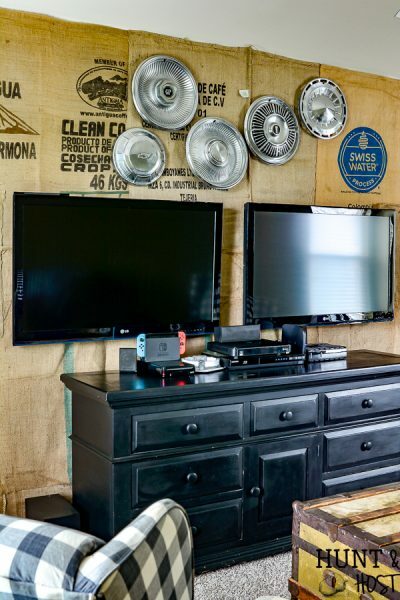 Today I am joining some friends to show you a few dollar store decorating ideas that prove it doesn’t have to cost a fortune to be great! Please be sure to pay a visit to the other projects highlighted at the bottom of this post! 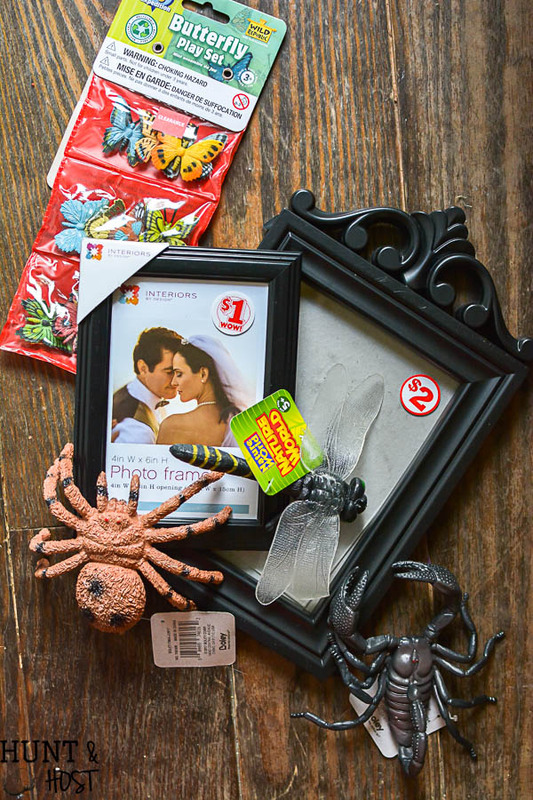 For my dollar store Halloween decorations I purchased a few plastic picture frames. I thought the scroll-y top was perfect for Halloween. I also gathered some big fake bugs, spiders and butterflies. I probably could have cleaned out my son’s room for these, but I spared his toys and got some new ones. 🙂 I picked a few different metallics to paint all the creepy crawly bugs and let them dry outside while I made boxes. I went with copper, champagne gold and a pearly white that I added a little glitter to. Glitter makes everything better. 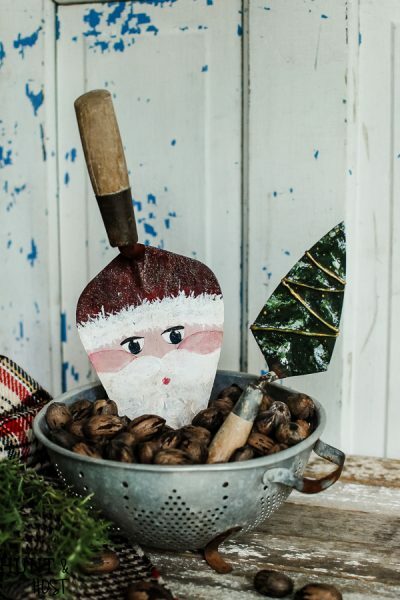 This list contains affiliate links so you can find exactly what I use, I may make a small commission should you make a purchase, your price stays the same. Thank you for your support! At first I was going to build wood boxes for these display cases, but decided that was just making matters harder than need so I went to my stand by project material. 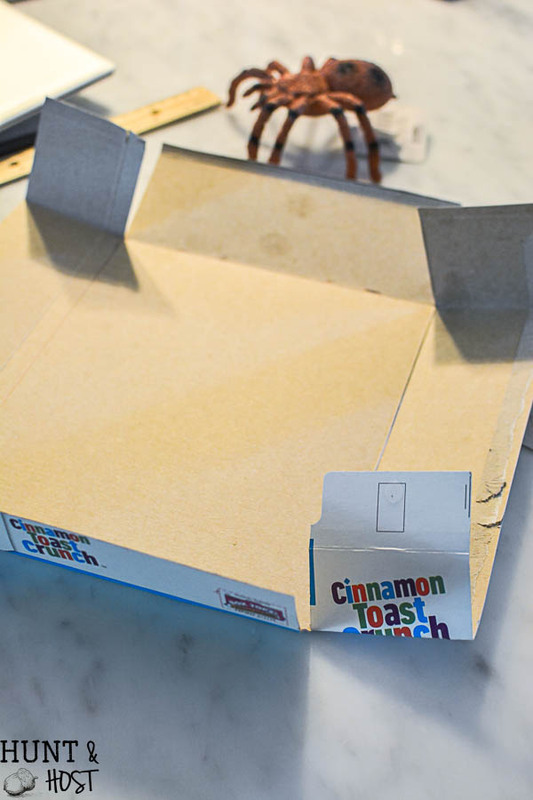 Cereal boxes for the win! I always have a stash on hand and you’d be shocked how much I use them! To make a box measure the back side of your picture frame and decide how deep your box needs to be to house your critters. Cut out a square plus the depth for example for an 8 X 12 box that is 1 inch deep cut out an 10X14 square. Next make four cuts, as shown in the picture, cutting a length that equals the desired depth of your box. Fold the edges up and wrap the cut flaps around the sides. 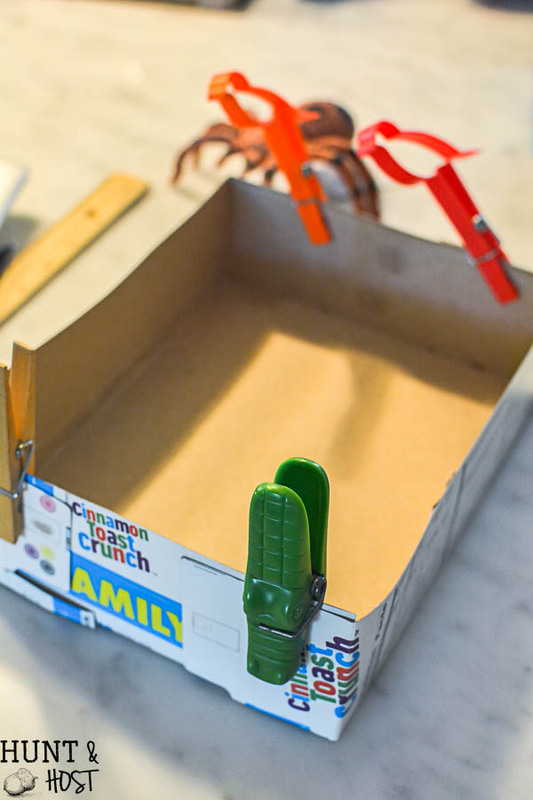 Use a strong, fast drying adhesive all purpose glue to secure the box. I held mine with clothes pins until the glue was dried. 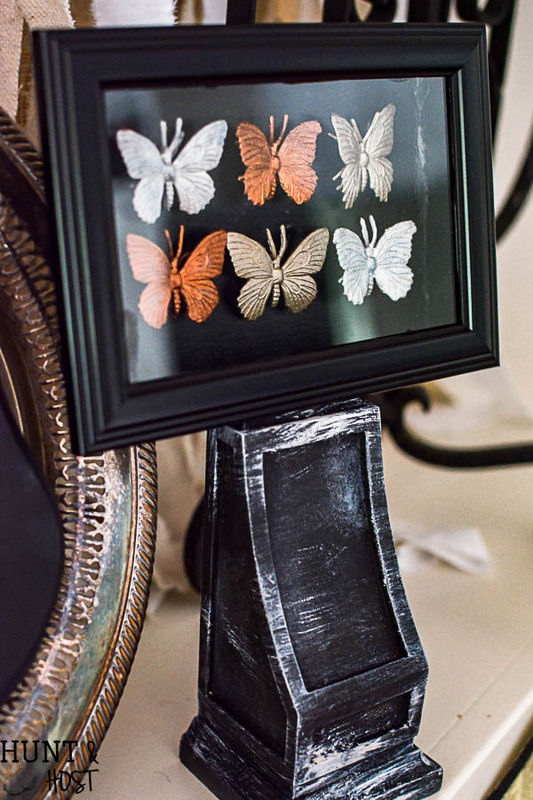 Once dry, spray paint the boxes black, inside and out. 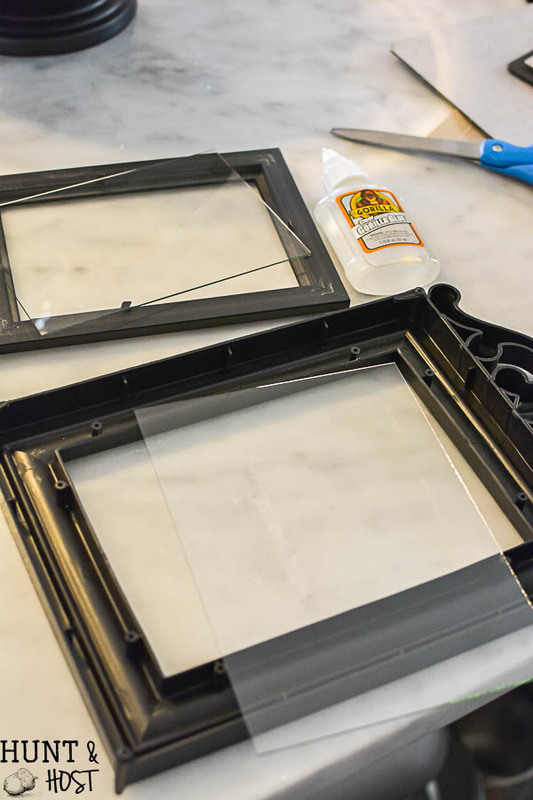 Glue the glass to the frame because there will no longer be a flat back to hold the glass in place. Once everything is dry glue the creepy peeps into the boxes, let that dry completely and then glue the box to the frame. For the other two I had a left over trophy plaque and old taxidermy mount that I painted and glued painted bugs to. WOW!! 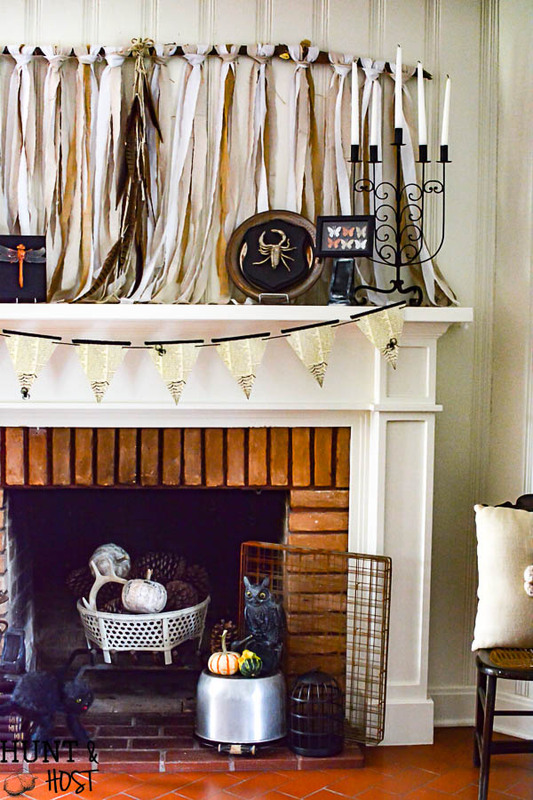 I don’t decorate for ‘Halloween’ but if I did… Can’t wait to apply these ideas in some other way! 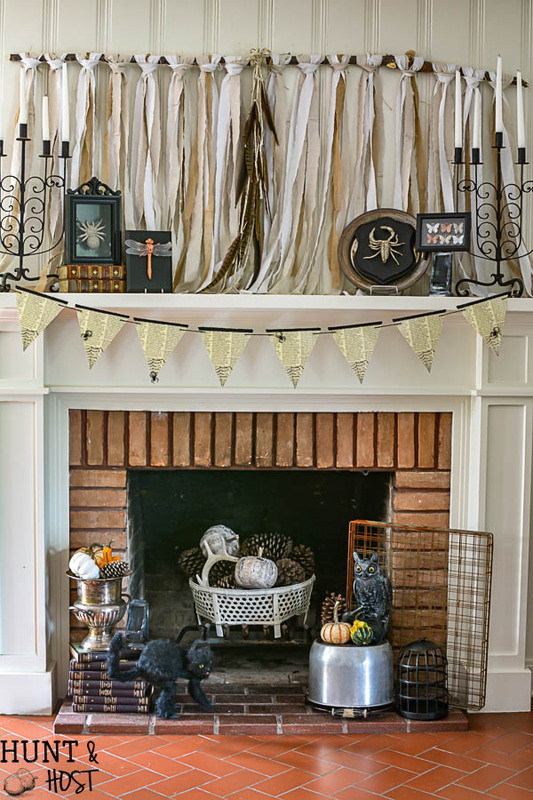 I know not everyone decorates for Halloween, we love to and YES you can absolutely use these ideas for other stuff! Happy crafting! 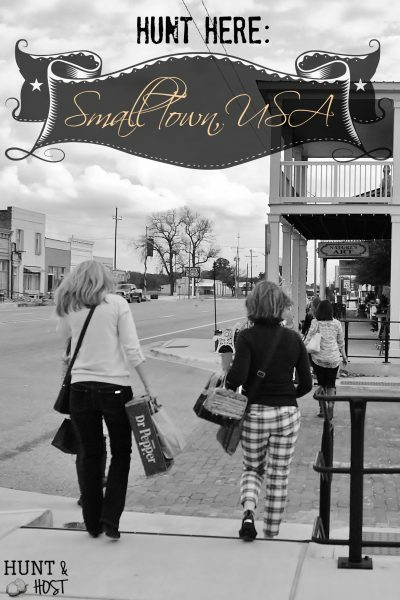 Hi Patti – thank you so much, I am so glad you have stopping by! Not sure why you can’t share on facebook, sometimes it is picky I guess! I am no facebook expert, wish I knew what to tell you! not sure exactly what light project you are talking about, let me know and I will see if I can find it! blessings friend. I bought a large beautiful old frame to go in the hall way, to put listings of words telling how and when we have been blessed in so many ways , little miracles that have happened, to encourage us when times are tough. Recordings of special days over the years that we need to remember . Funny sayings & actions from our children and grandchildren. Special things written about each of the children to know they are special. I think I may need two frames. I may end up filling a whole wall, have to call it the Kids Wall or something. I bet that is beautiful, what a great idea, you will have to send me pictures!!! thanks Joyce, they were fun to make! 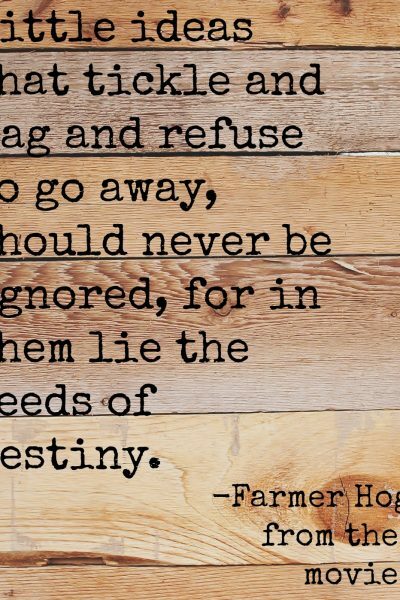 thank you – hope you go make some of your own! Great idea! Where did you find the dragonfly with the netted wings? 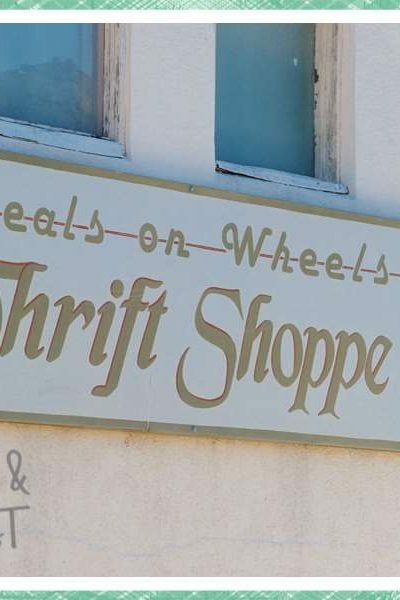 Dollar store – my go to for this kind of stuff!! !